Balsam Fir - Very symmetrical, narrow-crowned tree. Prefers moist, cool sites and is best adapted in wet areas. It is quite shade-tolerant. Uses: pulp, log cabin rafter poles and Christmas trees. 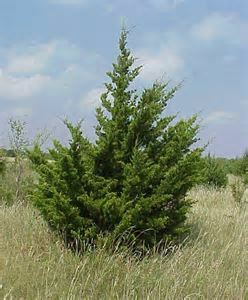 Concolor Fir - Provides winter cover for wildlife. Prefers dry to moist soils. Flat blue-green needles 1-1/2 to 2-1/2 in. long. Grows 75 to 100 feet tall. Douglas Fir - Well adapted to most sites. Moderately shade-tolerant. Planted for Christmas trees becaus of its naturally full form and needle retention. Provides winter cover for wildlife. Preferred deer food. 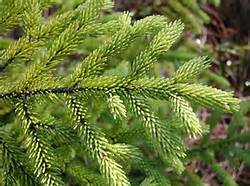 American Larch (Tamarack) - Moderately fast-growing native Michigan tree. Requires full sun and well-drained soils. Bright gold in color in fall, sheds all needles annually. Red Cedar - Full sun, resistant to extremes of drought, heat and cold. Very slow-growing, long-lived (200-300 years). The juicy "berries" are consumed by many kinds of wildlife, including the cedar waxwing, named for this tree. White Cedar - Excellent wildlife cover, timber production, soil stabilization and windbreaks. Likes full sun and moist soils. Protect from deer! Jack Pine - Fast-growing on better sites. Likes full sun and dry conditions. Excellent as wildlife cover, windbreaks, and for timber on poorest sites. 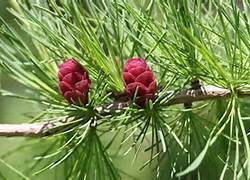 Red Pine - Fast-growing on sunny, well-drained sites. Shade-intolerant and long-lived. Valuable for timber reforestation, windbreaks and wildlife habitat. White Pine - Best established on well-drained soils in partial shade. Primary uses include: lumber, windbreaks, wildlife habitat. Caution: deer like to browse. Black Spruce - Likes wet soils and bogs including peats, clays, and loams. 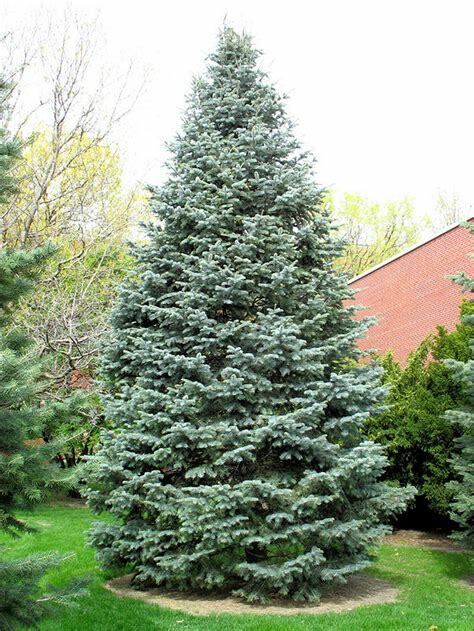 Grows to a height of 20-60 ft.
Blue Spruce - Shade-tolerant, slow-growing, but long-lived. Drought resistant once established. Excellent for windbreaks, soil stabilization and wildlife cover. 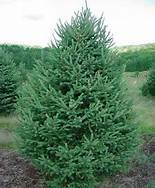 Norway Spruce - Moderately fast-growing, shade-tolerant, prefers moist soils. Useful for windbreaks and wildlife habitat. 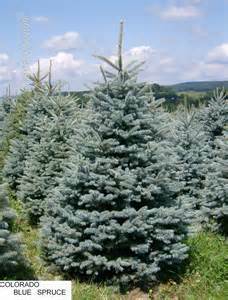 White Spruce - Prefers full to partial sun, dry to moist soils, moderate growth. Excellent for wildlife cover, windbreaks, and visual screens. American Hazelnut - Grows in a variety of soils, shade-intolerant. A very good food source for wildlife, the nuts are eaten by squirrels, chipmunks, blue jays, deer, grouse, turkey and pheasant. 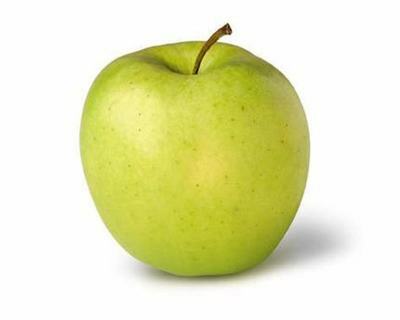 Domestic Apple - Grows to about 25 feet tall. Great deer and wildlife food source. Likes sandy, well-drained soil. 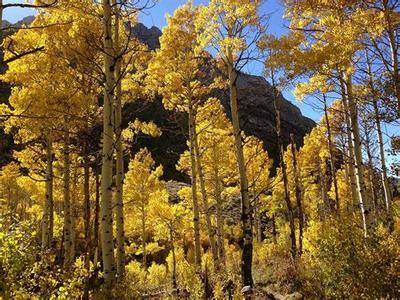 Quaking Aspen - Young quaking aspen provides food and habitat for a variety of wildlife. Regenerates rapidly after cutting. They allow more ground water recharge than do conifer forests and they also play a significant role in protecting against soil erosion. White Birch - Very shade-intolerant, fast-growing, short-lived (100 years or less). 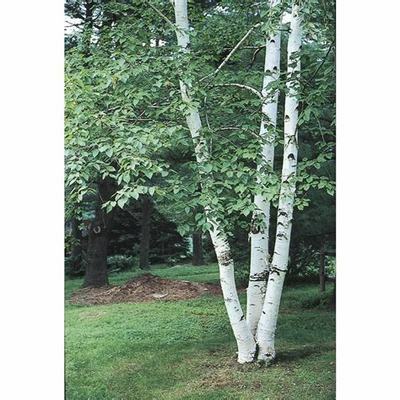 Bark becoming creamy white on outer surface of trunk and large branches. 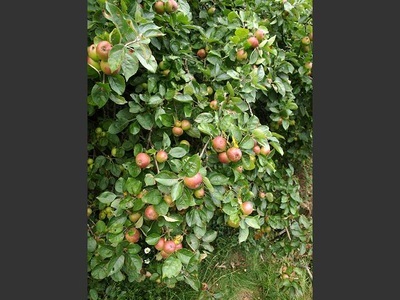 Tolerates a great variety of soils, often planted as an ornamental. 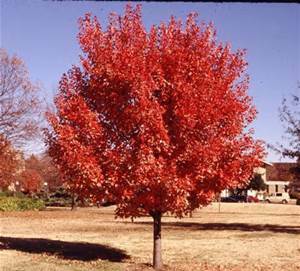 Red Maple - Shade-tolerant, relatively fast-growing; moderately long-lived. Among the first trees to flower in spring. Prefers moist, sandy-loam soils. Caution: A favorite food of whitetail deer. Brilliant fall color. 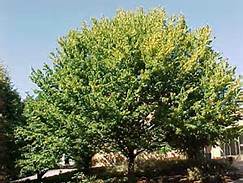 Sugar Maple - Large, highly shade-tolerant, slow-growing, long-lived with heavy, strong hard wood. Principal source of maple sugar, widely planted for its shade and extremely showy fall coloration. Caution: Deer like to browse. Red Oak - Needs full to partial sun and sandy to moist soils. It is the fastest growing of the northern oaks. Produces abundant acorns eaten by wildlife. White Oak - A majestic, large tree found in well-drained soils in dry and moist wooded areas. Leaves turn burgundy in fall. Slow-growing but worth the wait. 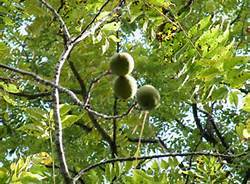 Black Walnut - Prefers moist (not wet) deep soils; produces valuable lumber; nuts edible for humans and wildlife. 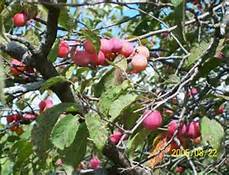 American Plum - Thicket-forming shrub to small tree, showy large white flowers and red plums. Prefers dry to moist soils and partial to full sun. Provides food and cover for wildlife. 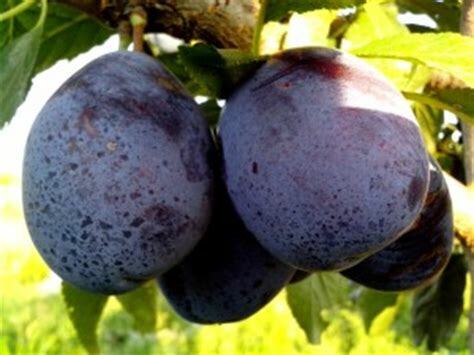 Edible fruit can be used to make preserves and jelly. 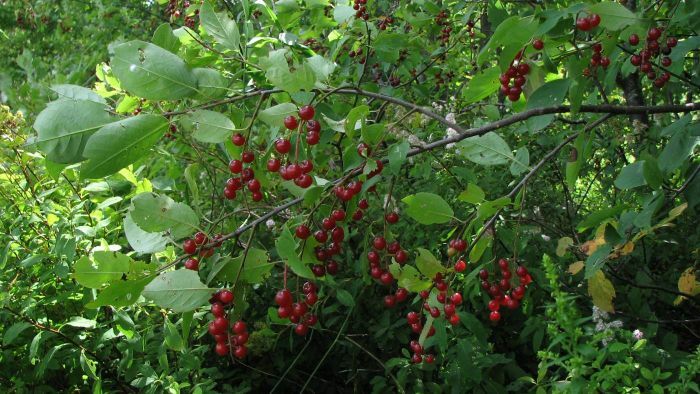 Choke Cherry - Prefers rich, moist soils. 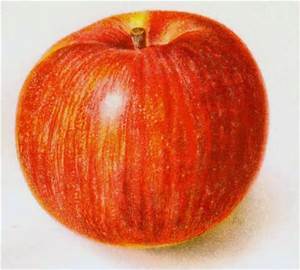 It fruit is a food source for many varieties of birds and wildlife. 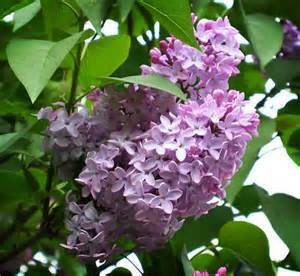 Common Lilac - A multi-stemmed shrub that forms thickets that are excellent wildlife cover. 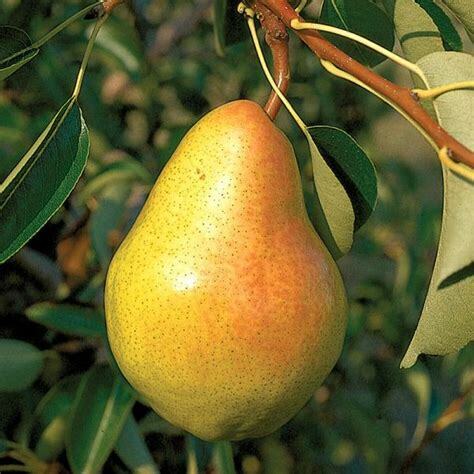 Needs full sun, can tolerate moist to dry sites. Fragrant, showy flowers in spring. 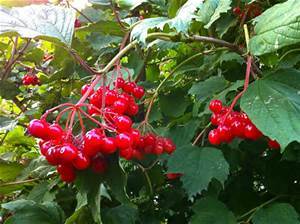 Highbush Cranberry - Prefers open or lightly-shaded swamps or wet ground. Produces handsome clusters of white flowers and scarlet fruits. Edible berries can be used for homemade jellies. Excellent wildlife plant. 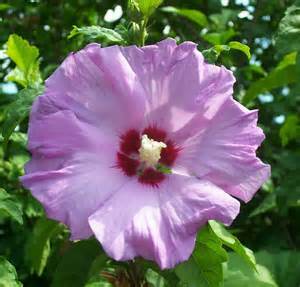 Rose of Sharon - Spectacular flowers. Blooms late summer, early fall. Saskatoon Serviceberry - A medium to large shrub with clusters of fragrant, white drooping flowers that appear in spring, followed by large, bluish-purple berries which are juicy and edible. 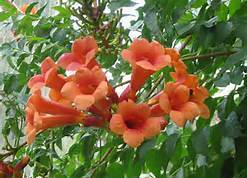 Trumpet Vine - Blooms in shade of bright orange and yellow. Attracts hummingbirds. 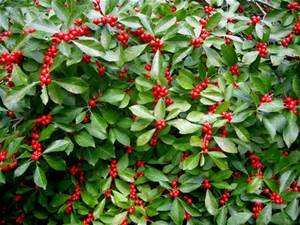 Winterberry Holly - Likes wet, acidic soil but will grow in the average garden. Berries are an important food source for birds in winter. 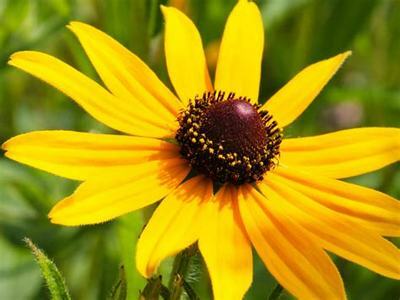 Black-Eyed Susan - The vivid contrast of brown cone and yellow petals make this a striking mass in the garden. Long bloom, low maintenance and few pest or disease problems. 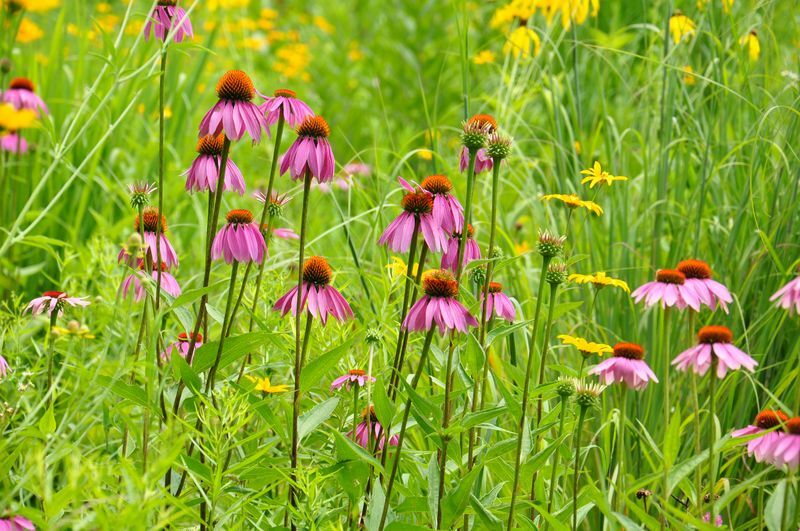 Supplies nectar for butterflies and seeds for birds. 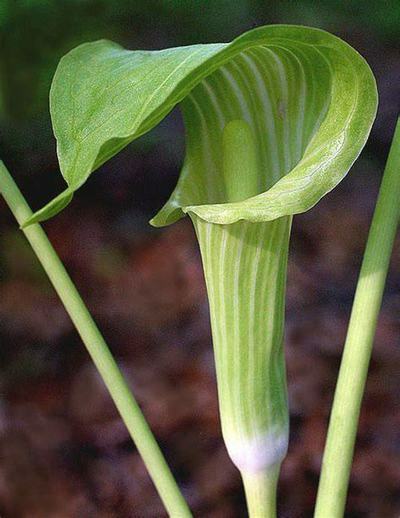 Jack-in-the-Pulpit - delightfully unusual native wildflower, Jack-in-the-Pulpit is a spring woodland favorite usually growing 16-20″ tall. 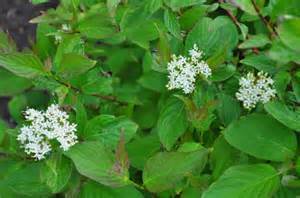 It is a charming plant with very unusual foliage and flower. 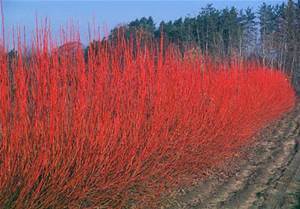 an excellent choice for the shade or woodland wildflower garden where it should be planted in rich soil and shade to partial shade. Purple Coneflower - Loves full sun. A virtual butterfly magnet. A beautiful cut flower, resists wind, heat and drought. White Trillium - 12-18" tall, snowy-white petals, blooms April-May, full to part shade, likes rich organic soil and average moisture. Northern Spy Apple - A very old fashioned variety. 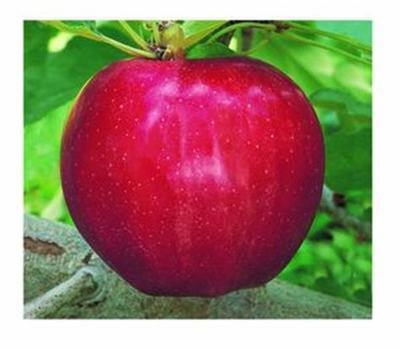 Very late ripening, great for pies. 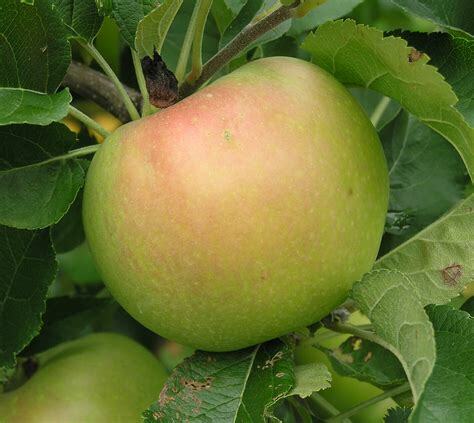 Auvil Early Fuji Apple - Has all of the positive characteristics of the Fuji apple but it ripens five to six weeks earlier than the original variety. 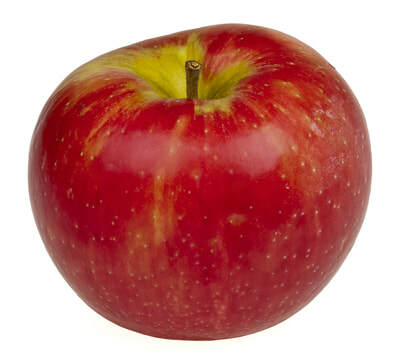 Mutsu Apple - Firm, juicy fruit with excellent dessert and processing qualities. 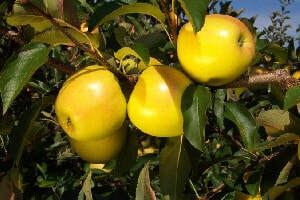 Arkansas Black Apple - Very late ripening heirloom variety with creamy white to pale yellow flesh. Pippin Apple - Old-time "antique" apple with excellent fruit quality. Will keep in cold storage for six months. 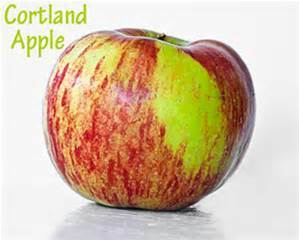 Cortland Apple - Crops heavier than most and considered an annual bearer. Pure white flesh. 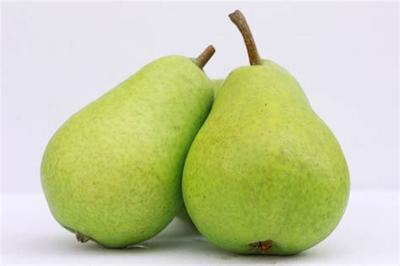 Anjoy Pear - Mild flavor and a firm texture, while still being sweet and juicy. Bartlett Pear - A large, heavy-bearing variety with excellent quality. Great for canning. 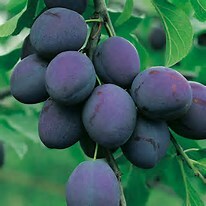 President Plum - Very large fruit with blue-black skin and yellow flesh. Sweet, rich flavor. 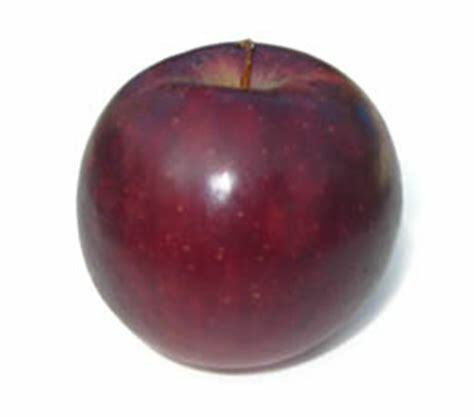 Bluebyrd Plum - Blue fruit and amber flesh, excellent flavor and high sugar content. 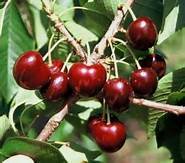 Meteor Cherry - Produces large bright red fruit. Flavor is mildly acid. Excellent for pies and sauce. Ripens early to mid July. Self-fertile. 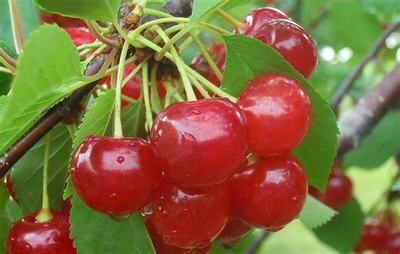 Montmorency Cherry - Most popular sour cherry. 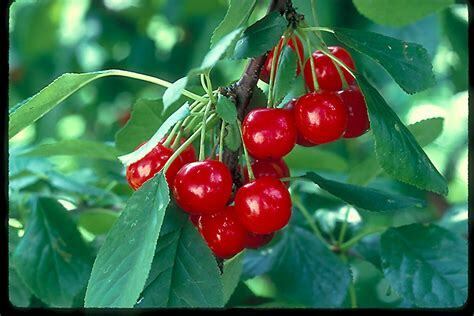 It is considered the best cherry for pie making.